Recently, a serious six-vehicle crash closed down U.S. Route 29 in Howard County, Maryland. The crash started in the northbound lanes when a driver was speeding and driving in an erratic fashion. Eventually, he hit a Honda CRV and a Honda Crosstour and slammed into the center median guardrail. His car flew into the air, landing on a Dodge Ram in the southbound lanes of the highway before striking a trailer, which was being towed by a Ford truck. Eight people were injured in the crash. Multiple people were ejected from the truck, and others were trapped in a vehicle. The driver was taken to Baltimore’s Shock Trauma, as were two passengers in his car. One of the victims of this accident was listed in critical condition. Others were not hurt. This situation appears to be one where one driver was responsible for multiple injuries and property damage to multiple vehicles. In Maryland, all drivers are required to have minimum liability limits of $30,000 per person, $60,000 per accident for bodily injuries, and $15,000 per accident for property damage. In multi-vehicle accidents where one person is at fault, multiple injured people will be competing for the policy limits. If only some of these claims are settled, the available policy limits may be exhausted. In general, this is a concern of a defendant’s insurer, which is opened up to a bad faith claim from its insured if there are several claims and insufficient coverage available. Sometimes the insurer will try to pursue a global settlement for its insured through mediation or discussions with all the potential plaintiffs. Insurers should tell all potential claimants of the fact that the policy limits are limited, even when the claimant is not represented. However, if you are hurt in a multiple car accident, it is smart to go to the hospital right away and retain counsel immediately so that your attorney has a chance to start working on your case. The responsible party’s insurer will start working right after the accident to figure out the scope of the insured’s exposure and will start to form opinions about liability. An insurer may even start to have direct negotiations with claimants and their attorneys. What if the amount you are offered is not enough to cover your medical bills? If you have underinsured motorist coverage, your own insurance company can step into the shoes of the negligent driver and offer coverage in the amount of the underinsured motorist coverage. Any sum paid by the at-fault driver’s insurance will be subtracted. In general, it’s prudent to have substantial uninsured or underinsured motorist coverage in case of multi-vehicle accidents like the one described above. 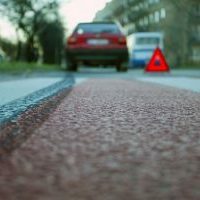 There are occasions when an insurance company fails to step up to its obligations under an underinsured motorist policy. In Maryland, an underinsured or uninsured motorist lawsuit has to be filed in Maryland courts within three years of the date an insured knows or should know of a potential claim against the insurance company for failing to honor its contractual obligations. If you are hurt in a multi-vehicle accident, you should consult with an experienced Maryland personal injury attorney as soon as possible. Contact the attorneys of Steinhardt, Siskind and Lieberman at (866) 902-4111 or via our online form. We can help you investigate all possible avenues of relief.